As a business owner, you know the importance of having other people know about your business. Advertising is rarely an option. Even those huge companies that you know well, who do not need to advertise (because you will likely go to them repeatedly) put a good deal of their profits back into advertising their business. As a small business owner, marketing your business is important. It does not matter if your business is a small one, such as a local repair shop or retail store, or a larger one, finding the right way to communicate with your prospective clients is critical. One of the biggest concerns a business has is getting their potential clients to know about them. You know you have a great service. You are confident that you can wow the customer with your abilities. Yet, they do not call. They do not come in to your store. They do not visit your website. The only way to help this process is by spreading the word about your business and letting everyone know what it is and what it can do for them. Do you have a strong advertising background? Most small business owners (offline and online) do not. Yet, you do not need to have this type of advertising background to find success through advertising means. The more creative and direct you are, the more successful you will be. Keep in mind some things you do not want to do such as promising more than you can offer. However, be as creative as you can be if you hope to attract new customers to your business. This book outlines the tips and strategies your business needs to do well in 2018, a year that promises to offer new opportunities, new insight and plenty of profit for those businesses that can provide they can advertise well. However, this is an area of business that is changing. If you are to find success in business in your 2018 advertising strategy, you need to stand out from the crowd and approach advertising in new and interesting ways. This book provides you with 101 ways to build an effective advertising plan. Advertising a business is still as important as ever. Each year, thousands of new companies open their doors. Internationally, hundreds of thousands of businesses get their start. Many of these businesses are direct competition for you. With that understood, it is important to consider a few more important details about advertising. With advertising, you need to be more creative than ever if you are going to stand out. A simple ad in the local newspaper is not enough to generate enough talk about your business to have people interested enough. A small banner ad on a moderately sized website is still not enough to generate the type of income that your business is looking for. More so, the times have changed. Consumers themselves are more used to shock advertising than ever. A scandal may hurt one person, but it can often bring higher revenues to a company. However, now, people have very high standards in where they shop, what they buy and what they pay for it. To further to explore that topic, consider these important factors when it comes to advertising your business. 1. It is easier for the consumer to do the same thing repeatedly. In other words, they are not going to go out of their way to visit your location or to remember your website’s domain name unless you have something that is new enough to them to make them want to do so. If it is easier to do something else, though, people will do that. 2. People do not want to pay more money for something. If you cannot compete with big companies, include those large department stores that seem to outdo every other company out there, then consumers will not pay attention to your business. Use your advertising budget to differentiate your business from the businesses of others. This is more important in 2018 because it now is more important than ever for people to watch every penny they spend. 3. Forget about misleading ads or promising more than you can offer. Most consumers are wise enough to see right through the advertisements that are obviously too good to be true. Consumers also do not want you to spam them, to overwhelm them with mail or email just to learn about your product or service. 4. There is more game in town. That means that there are more people competing for those all important ad spaces on your favorite websites. This may mean that your average advertising dollar is not going to do as much as you had hoped that it would. On the other hand, it may provide you with an ideal option for doing something big that is memorable. 5. The Internet, television, newspaper and even direct mail is all interconnected today. Your message needs to be strong enough to reach across all of these playing fields properly. If you use conflicting information, you will simply confuse your company. There are a few things to point out, in addition, that are more positive. For example, today’s consumer is well aware of the price of products, but they are still looking for a good deal. Getting more for their money is always going to be a big factor for the average consumer. Look for ways to add something to the product you are offering that helps it to stand out from the rest of the world’s products. More so, consumers are knowledgeable. They are happy to learn about new companies, but they want to learn about them before they will use them. Either through your website or through your advertising, you need to communicate who your business is, what it has to offer as well as what makes it unique and better than the rest. There are a few important messages that you want to use within the advertising that you do in 2018. These messages are what people are looking for. 1. Cost effectiveness: Price is a strong, important tool especially as more consumers are looking for a way to save money after taken advantage of by lenders, leaders and investments. 2. Environmental friendly: Today, people expect a business to be doing everything that it can to actually save the world. In your advertising, this can and sometimes should be the message that you give. Show the world that your business is committed to providing a safe haven for the environment. 3. Something new: Having a product that is new and better than someone else’s product is going to make an impression that you want to make on your customers. Although not all businesses will have the same level of expectation on this front, many business owners should advertise that they have something that trumps the other person’s product. 4. Easy access: With people saving more money, working more jobs to make ends meet and going out of their way to get the best of the best, it is important to alter customers that you have a product that is easy for them to use or easy for them to get to. Virtually all small businesses need to be online in 2018, even if you are not serving the entire Internet, but a local market. People turn to the web to learn what is happening and to find what they are looking for. 5. Trustworthy: Yet another important advertising method for 2018 will be trustworthiness. Of course, with so many people feeling taken advantage of by the horrors of the last few years, it is important to distance yourself and your business from those companies. Focus instead on being a company that is trusted, secure and a great place to be. When you put all of this together, you will have the right advertising plan for your business. 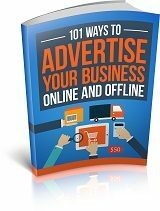 Throughout the rest of this book, you will find more than 100 tips and tricks to help you to advertise your business in 2018. Is this year any different from last? Of course it is. Today, it is even harder to get in front of others than ever and people expect a lot more than ever before. Can your business make it? With the right advertising plan, your business can excel. Take the time to consider the following tips and methods to improving your business advertising plan. Use as many of these methods as is possible, but do put together a cohesive plan that outlines your goals first. What does your advertising plan include? How many of the following types of advertising methods can you use? Consider the following steps. 1. Look at each of the advertising methods mentioned here. Determine which of these is most beneficial for your business. If it is a possibility, note that it is. If the plan seems to be a good one right off the bat, mark it as that. If there is no chance of it being usable for your business, you should cross it off.